L for Lionel Ladoire. Excellent musician, a niche to which I am not insensitive. 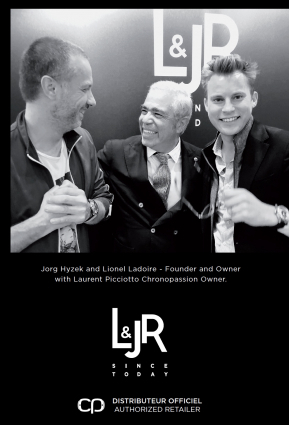 He is also a very good watch designer, which of course concerns us a little bit too! When he planned to launch L&JR, we met again. The idea: to launch a brand without any real watchmaking pretensions but with authentic creativity and a concern for perceived value. We were seduced by the project. L&JR is a very good creative exercise. Even if we are positioning ourselves at the top of the range, knowing that we could produce a very beautiful piece at a human price seemed relevant to me. Why? Why? Because it is not always necessary to spend a fortune on fine watchmaking. The little pleasures of everyday life are also made of beautiful watches that are well designed, well thought out and well positioned. Objects that we enjoy carrying without the precautions of a prestigious piece. L&JR responds to this need with pragmatism and intelligence. The collections are perfectly mastered. There is this impression of wearing a piece that is worth 10 times its real value. This is an offer we didn't have at Chronopassion. It complements our much more watchmaking and elitist selection - an alternative and cool proposal that, for the moment, has no equal.